Propeller Log records data for hub and blade inspections, repairs and alterations, airworthiness directives, and factory bulletins. 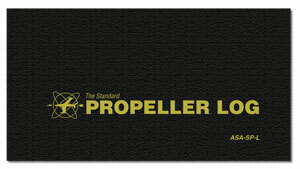 The ASA Propellor Log provides for excellent recordkeeping. Record data for hub and blade inspections, repairs and alterations, airworthiness directives, and factory bulletins. Soft cover, black, 7-1/4" x 4", 20 pages. The Avionics Log allows for easy recordkeeping for avionics equipment, VOR accuracy, transponder and ELT checks, AD and SB compliance, and maintenance records. The Engine Log keeps track of engine inspections, tests, repairs and alterations, airworthiness directives, manufacturers' mandatory service bulletins, and equipment removal or exchange.